The iPad is a wonderful device, but sometimes you need a fix iPad screen service in Dubai. The glass is, after all, made of glass. And we know what happens to glass when it falls crashing to the floor. This happens more often than any of us care to admit. Even the Apple technicians here at iRepairUAE.com have dropped, cracked, broken, and stepped on their iPhones and iPads. This of course would always result in broken screens and LCDs. Never a fun time. So, you need to fix iPad Screen in Dubai. We’re here to help. The iPad allows one to skim the web, write emails, and take and view pictures. Can you imagine a life without one? Or worse yet, a life with a cracked iPad screen? Unfortunately, the amazing machines don’t stand much of a chance when dropped off a table crashing to the tile floor. Such was the case with John this afternoon. 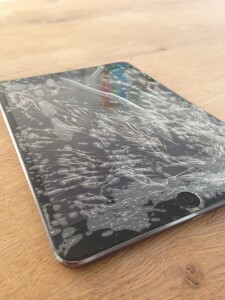 Although the case on his beloved iPad was on and closed, this iPad screen was shattered instantaneously. He couldn’t believe it! How could this happened? He kept such good care of it and treated it like it was a baby. Having picked it up with now damaged glass, he felt terribly saddened. It still functioned properly, but as you can see from the picture the lower left hand corner was badly damaged. John, who was not a happy camper to say the least, said he was embarrassed and devastated that he had broken his iPad in Dubai and needed the screen to be replaced. Like many others before him, he started to ask around if there was a Apple repair service in Dubai that could help. He gave us a call and we met with her the very next day. We put a new screen on and she had her iPad back to normal in no time.